Back in my college days I would supplement my income delivering produce to restaurants several mornings a week. Part of passing the time between stops included daydreaming, taking in the sights, and of course – listening to the radio. My delivery vehicle didn’t have a CD player or cassette so my only choice was to listen to what was on the airwaves. Pretty soon the Top 40 station was played out, so I flipped over to the AM dial to find what soon became an obsession – talk radio. It started with sports, but then went into political talk. Being the trying political times we were in at the time (late 90’s- early 2000’s), I was riveted by the discourse of the day. During a single delivery route, I would hear news and commentary from all over the world. At that time of my life, I found myself agreeing with and heartily supporting the views I heard. They made sense. I connected with the values I heard juxtaposed with my upbringing as a military kid. And, during this time outlets like Fox News and CNN exploded as well. Between 9-11 and the various wars in Iraq and Afghanistan, there was a lot to keep up with in our world – and a lot to say about these things as well. After a few years of this, I realized a couple of things about the media I was consuming – and about myself. “I can’t be wrong. Because if I get something wrong, then I will look foolish”. This wasn’t the quote verbatim, but it captures the essence of what he was saying. This commentator was caught in a remarkably honest moment where he played his cards for the world to see. He can’t be wrong or his career is down the tubes. On another evening I was listening to a certain political commentator rant on and on about a public figure using childish name calling and insults. While he was obviously a smart man, he relied on outlandish statements and hyperbole to get his point across. Then, I realized something about myself. I had become cynical and heard-hearted as those folks I listened to each day. In some ways, I had become them. I was suspicious of folks who thought differently than me. I assumed ill motives behind every opposing position. The world became black and white with no room for thought or creativity. Really, I didn’t like who I had become. I had given into the trap of hyperbole and sensationalism. I was officially a cynic. The problem is, this mindset doesn’t wash away quickly. Cynicism is a disease that grows and festers with every inward turn. Though I don’t really watch the news or listen to political talk radio anymore, I am still quite cynical about things like politics and church. Though I love our country and my Jesus, I am pretty cynical about the institutions that run and represent the things I love. I plan to write on Friday about some ways to overcome cynicism, but I want to hear your thoughts. How have you overcome your cynical side? 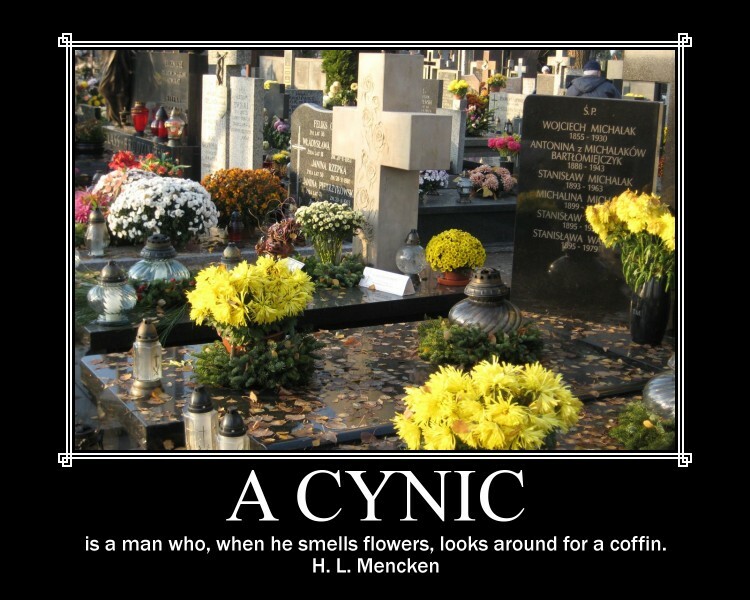 What qualities do you see in someone who is not cynical? Share with us! This entry was posted in Liturgical Year, Ordinary Days, Uncategorized and tagged cynic, Hope, hyperbole, listening to the radio, passing the time, political commentator. Bookmark the permalink.